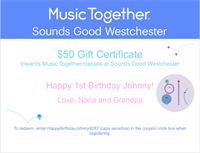 Give the gift of Family Music Making with a Sounds Good Westchester Gift Certificate. We'll email a gift certificate to you or to your recipient in PDF format, or we can mail the certificate via USPS to a specified address. Your gift recipient can use their certificate towards any upcoming semester with no expiration date. 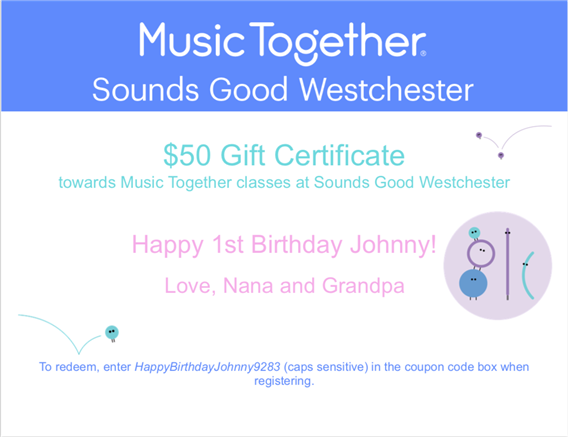 If you'd like to receive a gift certificate for yourself, feel free to forward this information to grandparents, or to anyone who wants to give a battery-free, clutter-free family gift. (Note to grandparents -- we LOVE having grandparents in our classes! You can register with your grandchild, or you can give the certificate as a gift and join us as a visitor at any time). 1. Who is the recipient? This name will go on the recipient line of the certificate. 2. How should we deliver the certificate -- Postal mail or Email? 3. Address (either postal or email) for delivery. 5. Any personalized message you would like to include!